After taking a few wine courses through UC Extension in the early '90s, Bay Area architect Ken Zinns developed a serious interest wine. Ken has been touring and tasting wines for nearly 20 years, and has come to love not only the wines, but also the people behind them. 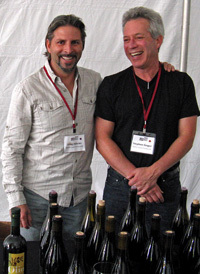 Ken's interest in wine is more than passive, and he's been working at several urban East Bay wineries since 2001, and is the assistant winemaker for both Eno Wines in Berkeley and Harrington Wine in San Francisco. Report on the 2nd annual West of West Wine Festival Grand Tasting, on Sunday August 5th, 2012, at the Occidental Center for the Arts in Occidental, California. The emphasis of the event is on wines from the western part of the Sonoma Coast AVA. 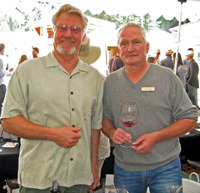 Held in the small town of Occidental, about halfway between Sebastopol and the Pacific coast, this year’s West of West Wine Festival ran from Friday August 3rd through Sunday August 5th. Beginning with several winemaker Welcome Dinners on Friday evening, the event continued with a series of Saturday seminars – the first one featuring Ted Lemon and his Littorai wines, and the other two focusing on the region’s Chardonnay and Pinot Noir. The first of two Grand Tastings was on Saturday afternoon, followed by the “Whole Hog Feast Celebration” that evening, and the festival concluded with a second Grand Tasting on Sunday afternoon. I attended the Sunday afternoon Grand Tasting, and all of the tasting notes below are from that portion of the event. I had not been able to attend last year’s inaugural West of West Wine Festival, so I was particularly glad that I did not have a date conflict again this year. The WSCV currently includes over 35 member wineries, and nearly all of them poured their wines at the Grand Tasting on Sunday. It’s important to note that not all of the wineries themselves are located within the western Sonoma Coast area – many of the organization’s winery members are located in other areas but source fruit from the western Sonoma Coast. The western part of the Sonoma Coast AVA – sometimes referred to as the “true” or “extreme” Sonoma Coast – is a very distinctive cooler-climate growing area, and it is no surprise that its growers and vintners have created their own organization. 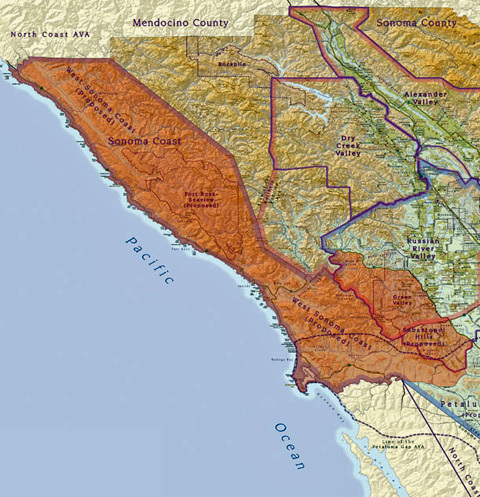 For years, it has been evident that the current boundaries of the Sonoma Coast AVA include too broad a group of growing regions. The WSCV includes the more westerly regions – Annapolis, Fort Ross-Seaview, Occidental, Freestone, Green Valley and the Sebastopol Hills. Notably absent are the parts of the Sonoma Coast AVA that are farther east, such as the Petaluma Gap. While unquestionably a fine cooler-climate area in its own right, the Petaluma Gap shares little else in common with most of the growing regions closer to the Pacific coast. Founding members of the WSCV included Failla, Freeman, Freestone Vineyards, Peay, and Red Car, and Red Car’s Carroll Kemp was the organization’s first president. 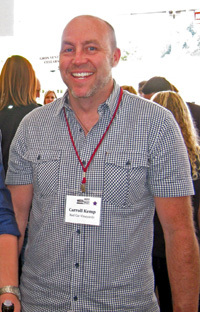 Andy Peay is the current president. To what extent the western Sonoma Coast growers and wineries seek to differentiate themselves from the rest of the AVA is not yet clear. One pre-existing application for a separate AVA was approved late last year by the Federal Tobacco Tax and Trade Bureau (TTB) – the Fort Ross-Seaview AVA. Encompassing a region north of the Russian River but south of the Annapolis area, it includes vineyards for Failla, Flowers, Hirsch, and Marcassin among others. Could this new appellation be a sign of further small AVAs within the Sonoma Coast? It’s possible, although it doesn’t appear as if any additional ones are likely in the near future at least. Chardonnay and Pinot Noir are the dominant grape varieties grown in the area defined by the WSCV, while Syrah plays a lesser but important role there. Other varieties comprise a much smaller percentage of the grapes grown in the region. So it was no surprise that the vast majority of wines being poured at the West of West Grand Tasting were either Chardonnay or Pinot Noir. The tasting presented an excellent opportunity to taste wines from some top-notch producers, several of which don’t often pour at public tastings. 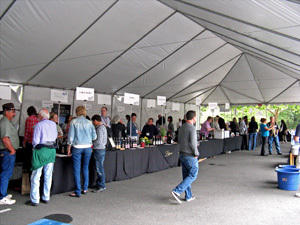 The Grand Tasting was held under a large tent set up in the parking lot of the Occidental Center for the Arts, just a short distance from “downtown” Occidental. The tiny town seems to have barely changed since my parents used to take my brother and me there on occasion many years ago for a family-style Italian dinner at one of two restaurants facing one another across the road – Negri’s and the Union Hotel. The Grand Tasting venue worked very well, particularly given the exceptionally mild weather of this year’s event weekend. This was a fairly small, low-key tasting, at least on Sunday – though not surprisingly, I heard that the Saturday tasting had been more crowded. Each winery table allowed plenty of space, and I encountered little waiting to get a pour at any of the tables. It was great to see so many of the winemakers themselves behind the tables, too – something you don’t see as much at most larger events. The tasting was well-organized and ran smoothly from beginning to end. I tried to visit as many producers as possible who were new to me, although – as always happens at these tastings – I missed several others I would have liked to visit. I did skip a few whose wines I’d tasted at other recent events (Lioco, Failla, Flowers, Peay) though I did revisit a few others that were pouring wines I had not tasted before (Anthill Farms, Freeman, Hirsch, Joseph Phelps, Littorai, Red Car). I did end up tasting “repeat” wines at Ceritas, though they were good ones so I didn’t mind too much that I revisited them. In many ways, the West of West tasting was quite similar to the In Pursuit of Balance (IPOB) tasting that I attended in March of this year – quite a few of the same producers, with a focus on Chardonnay and Pinot. But the intent of this tasting vs. the IPOB one – a showcase of place rather than style – did put a different slant on the wines. Vineyard sources for the wines poured at the tasting were from all over the Sonoma Coast AVA – by far, the most were from the western part of the region but there were also a small number that were partially or entirely from the Petaluma Gap area. A fair number of producers highlighted their own estate vineyards, while in other cases it was possible to compare wines sourced from the same vineyard but made by different vintners – for example, I tasted Hirsch Vineyard Pinots from four producers. It was also interesting to compare the 2009 and 2010 vintages, since most of the wines I tasted were from those two years. I only tasted a direct vintage comparison of the same wine from the same producer in a couple of cases, but in general, the 2009s were somewhat bigger, richer wines and the 2010s a bit lighter and brighter in character, as you’d expect from that cooler vintage. For young wines, I felt the 2010s showed very well overall, with many of them being among my favorites of the tasting. Favorite producers included relatively well-known labels Baker Lane, Bohème, Ceritas, Cobb, and Littorai, as well as one I’d never encountered before – 32 Winds. But there were strong showings from many other wineries as well. Newcomers Gros Ventre and LaRue impressed me with their wines. As with the IPOB tasting, I found an unusually high percentage of very good wines at the West of West event. 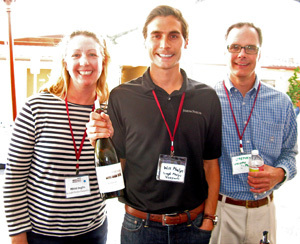 The West of West Wine Festival Grand Tasting was relaxed, fun, and featured lots of fine wines. Overall, this was one of the best tastings I’ve attended this year, and it was an excellent showcase of what the western Sonoma Coast has to offer. 32 Winds 2010 Chardonnay, “Spinnaker,” Sonoma Coast. Sourced from an organic, dry-farmed vineyard, fermented in 30% new French oak. Light yellow color, this displayed bright apple and spice aromas along with touches of flowers, lees, and vanilla/oak. Medium-bodied with a lively texture, this should develop nicely in the bottle. 32 Winds 2010 Pinot Noir, “Maestro,” Sonoma Coast. From an organically-farmed vineyard in the southern part of the Sonoma Coast AVA, with Calera and Swan selections of Pinot, aged in about 35% new French oak. Medium color, with higher-toned notes of ripe red fruit, herbs, and earth. Medium weight on the palate, this finished with milder tannins. 32 Winds 2009 Pinot Noir, Hirsch Vineyard, Sonoma Coast. From a mix of Pinot clones, aged in about 40% new French oak. Medium ruby color, featuring black cherry and plum, spice, plus touches of herbs and minerals. Richer mouthfeel than the “Maestro” but with more structure, this had moderate tannic bite on the finish, nice. Comments: 32 Winds is a fairly new venture, with the first release from the 2006 vintage. The wines are made by Ehren Jordan of Failla and Turley. Steve Humble heads up the winery and was behind the table at the event. Anthill Farms 2010 Pinot Noir, Peters Vineyard, Sonoma Coast. From 20-year old 777 and Pommard clone vines. Medium color, this displayed plum and black cherry fruit, earth, spice, and a mineral note. Bright acidity in the mouth with good structure and a medium-big tannic grip. Nice wine that should age well. Comments: The Peters Vineyard Pinot is a recent release from Anthill Farms that I had not tried before. The vineyard is near Sebastopol. Baker Lane 2010 Pinot Noir, “Sonoma Coast Cuvée,” Sonoma Coast. Medium color, with earthy plum aromas along with hints of fresh herbs and sweet oak. Very lively mouthfeel with a bright finish. Baker Lane 2009 Pinot Noir, Ramondo Vineyard, Sonoma Coast. Somewhat darker color, showing more earth, pepper, and spice on the nose plus red fruits. More acidity and structure in the mouth than the first wine, with a grippier finish, in need of more time in the cellar. Baker Lane 2010 Syrah, “Sonoma Coast Cuvée,” Sonoma Coast. Sourced mostly from the estate vineyard along with a little Ramondo Vineyard fruit, aged in puncheons, about 10% new. Medium-dark purple, this featured bright blackberry fruit along with black olives, herbs, and iron/mineral aromas. Medium-bodied and lively, this had moderate tannins on the finish. Showing exceptionally well for a young cool-climate Syrah, this ought to age nicely too. Baker Lane 2008 Syrah, Estate, Sonoma Coast. Entirely from estate fruit, aged in puncheons, about 20% new. Dark color, this has more intense dark berry fruit aromas than the first Syrah, while showing similar herb and iron components as well as some smoky and meaty notes. Bigger in body and structure, this finished with grippy tannins. Northern Rhône-like in character and very much on the young side right now, this should continue to develop for many years. Comments: Fruit for the Baker Lane wines comes mostly from their estate vineyard and from nearby Ramondo Vineyard, which they manage. The Pinots were good but I thought the Syrahs were the real stars of the line-up – both were standouts. Stephen Singer and Greg Adams were behind the table. Bohème 2009 Chardonnay, Taylor Ridge Vineyard, Sonoma Coast. The vineyard is at about 900-foot elevation west of Occidental, planted to Wente clone Chardonnay. The wine was made in about 67% neutral oak and 33% stainless steel. Medium straw color, this had bright apple and stone fruit aromas, along with lees and a touch of spice. Lively and textured on the palate, with a crisp, clean finish, nice. Bohème 2009 Pinot Noir, Stuller Vineyard, Sonoma Coast. Stuller Vineyard is about 300 feet higher than Taylor Ridge, and though south of the Russian River, the soil is more typical of the Cazadero area farther north. Both 115 and 667 Pinot clones went into this wine. Medium ruby color, displaying black cherry, earth, and herbs on the nose. Bright mouthfeel and finish. Bohème 2009 Pinot Noir, Taylor Ridge Vineyard, Sonoma Coast. From Swan clone vines planted about 12 years ago. Medium color, this showed more intense plum and blueberry fruit plus lots of spice and a touch of vanilla/oak in the background. Medium-bodied and richer than the Stuller bottling, this had a longer finish that also had a bit more tannic grip. Bohème 2009 Pinot Noir, English Hill Vineyard, Sonoma Coast. The vineyard is near Bloomfield in the southwest Sebastopol Hills, from five Pinot clones planted by Kurt Beitler in 2005. Medium color, with bright ripe cherry, earth, and mineral aromas plus hints of flowers and pepper. Medium weight on the palate with very good structure and firm tannins that will need some bottle age, nice. 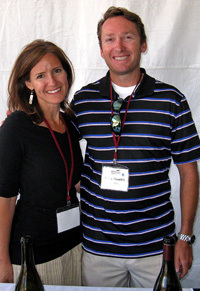 Comments: Kurt Beitler (grandson of Caymus Vineyards’ Charlie Wagner) launched the Bohème label with the 2004 vintage. He poured one of the strongest group of wines I tasted at the event. Ceritas 2010 Chardonnay, Heintz Vineyard, Sonoma Coast.From 30-year old Wente clone vines. Light straw color, this featured citrus, spice, and floral scents. Medium-light weight in the mouth with zippy acidity and a clean, fresh finish, very nice. Ceritas 2010 Chardonnay, Porter-Bass Vineyard, Sonoma Coast. From 30-year old vines, made in older oak. Light straw color, showing more upfront ripe apple and stone fruit than the Heintz bottling, plus a leesy note. This had a richer mouthfeel but with fine balancing acidity and a lively finish. Ceritas 2010 Pinot Noir, Escarpa Vineyard, Sonoma Coast.From100% Swan selection. Medium light color with earthy black cherry and plum, pepper, and herb aromas. Medium-bodied, minerally and structured, with firm tannins that will need time to mellow out. Nice wine that should age quite well. Comments: Although it turned out that I had tasted all three of these Ceritas wines a few months earlier, it was worth revisiting them here. Owner/winemaker John Raytek presented a fine line-up of wines. Heintz 2009 Chardonnay, Sonoma Coast. Light yellow color, with spiced apple and vanilla aromas. Medium-rich texture on the palate with a long, smooth finish. Heintz 2009 Pinot Noir, Sonoma Coast. From 100% Swan selection. Medium color, showing plum and darker berry fruit, earth, and lots of baking spice on the nose. Medium weight with a fairly smooth mouthfeel, the finish was a bit tangy with only mild tannins. Heintz 2009 Syrah, Sonoma Coast. Medium-dark color, this had higher-toned aromas of plums, flowers, and herbs. Medium-bodied with a bright mouthfeel, this finished with moderate tannins. Comments: All of the fruit for the wines is sourced from the estate Heintz Ranch vineyard. Owner Charlie Heintz was on hand at the tasting. Cobb 2009 Chardonnay, Joy Road Vineyard, Sonoma Coast. Barrel-fermented with about 25% new oak. Medium straw color, with apple and pear fruit, spice, a mineral note, and a touch of vanilla/oak on the nose. Medium-bodied with a lively texture and long finish, nice. Cobb 2009 Pinot Noir, Emmaline Ann Vineyard, Sonoma Coast. From about 67% 115 clone and 33% 777, about 20% whole-cluster fermentation and 30% new oak. Medium-light ruby color, with slightly floral red cherry, herb, and earth aromas. Bright mouthfeel with very good structure, and a long finish with moderate tannins, nice. Cobb 2007 Pinot Noir, Emmaline Vineyard, Sonoma Coast. 100% destemmed fruit. Medium color, this showed higher-toned earthy red fruit with some forest floor notes. Medium weight on the palate with plenty of acidity, though the finish was a bit short. Comments: Ross Cobb (who also makes the wines for Hirsch Vineyards) was behind the table, and he poured a Chardonnay and a Pinot that were among my favorites of the day. Freeman 2010 Pinot Noir Rosé, Sonoma Coast. Made from saignée. Light pink color, featuring ripe strawberry, herb, and slightly floral notes. A mid-weight Rosé, this had a fairly smooth finish. Freeman 2010 Pinot Noir, Sonoma Coast. Sourced from seven vineyards. Medium-light color, this had bright red fruit, baking spices, a touch of fresh herbs, and undertones of sweet oak. Medium-light weight on the palate, with fairly mild tannins on the finish. Freeman 2010 Pinot Noir, “Akiko’s Cuvée,” Sonoma Coast. A barrel selection, sourced from nine vineyards in 2010. Slightly darker color, with strawberry, cherry, and spice aromas, plus forest floor and earth notes. Medium-bodied with more structure than the Sonoma Coast bottling, this had a lively, tasty finish, nice. Comments: Ken & Akiko Freeman poured their wines at the event. I had tasted the 2010 “Akiko’s Cuvée” Pinot several months ago, and it showed very well once again. Gros Ventre 2010 Pinot Noir, Sonoma Coast. From eight Pinot clones, aged in 25% new French oak. Medium-light color, with cherry and raspberry fruit, earth, spice, and a touch of black pepper. Medium-bodied with good structure, this finished with mild to moderate tannins. Gros Ventre 2009 Pinot Noir, “First Born,” Sonoma Coast. Mostly 115 and Pommard clones, sourced from several vineyards, aged in about 40% new oak. Medium ruby color, this featured riper black cherry and plum, spice, and vanilla/oak aromas. Richer mouthfeel than the 2010 bottling, with a smoother finish. Comments: Owner/winemaker Chris Pittenger was behind the Gros Ventre table. He’s also the winemaker for Skinner Vineyards in El Dorado County. 2009 was the first vintage for the Gros Ventre label. The winery also makes a very nice Pinot from Cerise Vineyard in Anderson Valley. Hartford Court 2009 Chardonnay, Far Coast Vineyard, Sonoma Coast. Fermented in 40% new French oak. Medium yellow color, showing ripe apple and spice, with hints of tropical fruit and flowers, and undertones of vanilla/oak. The mouthfeel balanced a creamy texture with a minerally acidity, and the finish was long and tasty, nice. Hartford Court 2008 Chardonnay, Seascape Vineyard, Sonoma Coast. Fermented in 50% new French oak. Medium yellow color, this displayed more citrus and herb character along with stone fruit and spicy oak notes. More full-bodied but with a bright texture in the mouth and on the finish. Hartford Court 2009 Pinot Noir, “Land’s Edge Vineyards,” Sonoma Coast. Sourced mostly from Far Coast Vineyard, with mostly 667 and 777 clones, and aged in 45% new French oak. Medium-light color, featuring ripe plum, earth, forest floor, baking spice, and sweet oak on the nose. Medium-bodied with lively acidity and moderate tannins. Hartford Court 2009 Pinot Noir, Far Coast Vineyard, Sonoma Coast. Mostly from 777 clone Pinot, aged in 45% new French oak. Medium ruby color, with a bigger spice component plus black cherry and darker berry fruit, herbs, and minerals, with better-integrated oak. Bigger and more structured on the palate, this finished with grippier tannins. Comments: Far Coast Vineyard is located near Annapolis, while Seascape is west of Occidental. The “Land’s Edge Vineyards” bottling is sourced from several vineyards, with most of the fruit coming from Far Coast. I thought the Chardonnays in particular were quite good. Hirsch 2009 Pinot Noir, “San Andreas Fault,” Sonoma Coast. From Pommard, Swan, Mt. Eden, 114, and 777 clones. Medium color, displaying red fruits and plums, spice, and forest floor notes. Medium-bodied with lively acidity and moderate tannins. Hirsch 2009 Pinot Noir, “East Ridge,” Sonoma Coast. From Pommard, Swan, and Mt. Eden clones. Slightly darker color, with riper fruit and more oak spice on the nose, along with earth and dried herbs. Bigger and more structured on the palate, this had grippier tannins on the finish. Comments: The “San Andreas Fault” Pinot should be a good bet for more near-term drinking while the “East Ridge” will need more time. Joseph Phelps 2010 Chardonnay, Freestone Vineyards, Sonoma Coast. All barrel-fermented, in both new and older French oak. Light yellow color, with apple, pear, and spice aromas with undertones of vanilla/oak. Creamy texture with moderate acidity and a fairly smooth finish. Joseph Phelps 2009 Pinot Noir, Quarter Moon Vineyard, Sonoma Coast. Mostly Calera and 777 clones along with others, from a steeply-sloped vineyard site. Medium color, displaying bright cherry, plum, earth, and spice, plus an herbal note. Medium-bodied and structured, a promising wine with youthful tannins that will need time to mellow out. Comments: These wines were previously under the separate Freestone Vineyards label, but they’re now labeled as Joseph Phelps – they developed and own the vineyards, located in the cooler region of the western Sonoma Coast. The Quarter Moon bottling is from a single vineyard parcel. LaRue 2009 Pinot Noir, Sonoma Coast. Sourced from Rice-Spivak, Emmaline, and Joy Road vineyards, aged in 30% new French oak. Medium-light color, with tart cherry, earth, and herb aromas. Medium-bodied with a smooth texture and finish. LaRue 2010 Pinot Noir, Sonoma Coast. Sourced entirely from Rice-Spivak Vineyard, aged in 40% new French oak. Slightly lighter ruby color than the 2009, with brighter red fruits, spice, and savory notes. Medium weight on the palate, with more structure than the 2009 bottling and a lively texture and moderate tannins on the finish, nice. 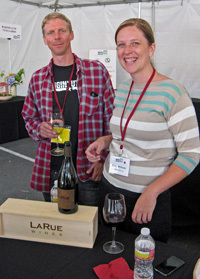 Comments: The 2009 Pinot was the first release from LaRue, whose owner/winemaker Katy Wilson poured the wines at the event. I thought the 2010 Pinot was a step up and one of my favorites of the event. Littorai 2010 Chardonnay, B.A. Thieriot Vineyard, Sonoma Coast. Whole-cluster pressed, with about 25% new French oak. Light straw color, with bright apple and citrus, flowers, herbs, and minerals on the nose. Medium weight with very lively acidity, this had a long, clean finish, nice. Littorai 2009 Pinot Noir, The Pivot Vineyard, Sonoma Coast. From twelve Pinot clones. Medium ruby color, with ripe plum, earth, and stony mineral aromas plus a touch of pepper. Medium-bodied with the structure for aging but with refined tannins on the finish, nice. Littorai 2009 Pinot Noir, Hirsch Vineyard, Sonoma Coast. From Pommard, Swan, and 114 clones. Medium color, this had floral, spice, and dark berry fruit scents. A bit lighter on the palate than The Pivot but with a bigger tannic structure and more bite on the finish. Littorai 2009 Pinot Noir, The Haven Vineyard, Sonoma Coast. Medium color, this displayed more earth, spice, and herb notes in addition to darker fruit. Richer mouthfeel along with firm, grippy tannins, this is in need of a good deal of cellar time. Comments: B.A. Thieriot Vineyard and estate vineyards The Haven and The Pivot are farmed biodynamically, while Hirsch Vineyard is in the process of being converted to biodynamic farming. The Pivot Vineyard is located adjacent to the winery west of Sebastopol. Ramey 2009 Chardonnay, Platt Vineyard, Sonoma Coast. Straw color, displaying ripe stone fruit and pear fruit, spice, and vanilla/oak aromas. Medium weight with a creamy, nicely-structured mouthfeel and a long finish. Ramey 2010 Chardonnay, Platt Vineyard, Sonoma Coast. Straw color, this featured brighter, more citrusy scents along with hints of flowers and herbs. Not quite as rich on the palate as the 2009 bottling but with a livelier texture, and a crisp, clean finish, nice. Comments: Platt Vineyard is located above the town of Bodega, with Wente clone vines planted on Goldridge soil. The wines are fermented with native yeasts in about 67% new French oak, and are stirred weekly. Both wines were very good and quite different from one another. Red Car 2011 Chardonnay, “Trolley,” Sonoma Coast. Light straw color, very bright aromas of pear, stone fruit, earth, and spice. Lively mouthfeel and a clean finish. Red Car Estate 2010 Pinot Noir, Estate Vineyard, Fort Ross-Seaview. From 777 and 828 clones. Medium-light ruby color, this showed bright red berry fruit, herbs, plus hints of flowers. Medium weight with good acidity and a slight minerally note in the mouth, this was structured and tannic, but has the components to develop with bottle age, nice. Red Car 2010 Pinot Noir, “The Aphorist,” Bartolomei Vineyard, Sonoma Coast. From a vineyard northwest of Forestville, with mostly Jackson 16 clone going into this wine. Medium color, with black cherry, earth, and floral notes on the nose. Richer mouthfeel than the Estate bottling, with moderate tannins. Red Car 2010 Pinot Noir, Zephyr Farms Vineyard, Sonoma Coast. From 115 and 667 clones, the vineyard is near Freestone. Medium-dark color, showing riper cherry and plum, spice, and a touch of vanilla/oak. A more full-bodied Pinot with a big structure to match, this will take time to settle down. Red Car Estate 2009 Syrah, Estate Vineyard, Sonoma Coast. Dark color, this displayed plum and darker berry fruit, grilled meat, pepper, and earth. Medium-bodied and fairly lively on the palate, with moderately grippy tannins. A youngster that could develop nicely with some time in the cellar. Comments: The 2010 Estate Pinot was labeled with the recently-approved Fort Ross-Seaview AVA. The estate vineyard is located on King Ridge, north of Hirsch Vineyard. Red Car owner Carroll Kemp was behind the table. Siduri 2010 Pinot Noir, Hirsch Vineyard, Sonoma Coast. From 100% Mt. Eden clone. Medium-light color and very slightly cloudy, this featured bright red fruits, earth, herbs, and minerals on the nose. Medium-light weight on the palate with very lively acidity, this had a long, tasty finish with fairly mild tannins, very nice. Comments: I had a chance to taste several Pinots made from Hirsch Vineyard fruit at the event, and the Siduri rendition may have been my favorite. Sojourn 2011 Chardonnay, Sonoma Coast. Sourced from Keller and Sangiacomo vineyards, barrel-fermented in 30% new French oak, this will be released in September. Straw color, this featured bright apple, floral, and leesy aromas along with some well-integrated oak. Medium-bodied and lively in the mouth, with a clean finish, nice. Sojourn 2010 Pinot Noir, Sonoma Coast. Sourced from five vineyard ranging from the Annapolis area to the Petaluma Gap. Medium color, showing ripe red fruits, spice, and touches of earth and pepper. Medium weight with moderate tannins on the finish. Sojourn 2010 Pinot Noir, Ridgetop Vineyard, Sonoma Coast.The vineyard is near Annapolis. Medium color, this had ripe cherry, spice, and vanilla/oak on the nose. Bigger structure than the Sonoma Coast bottling with fairly grippy tannins, this has potential but clearly needs time to develop. Sojourn 2010 Pinot Noir, Sangiacomo Vineyard, Sonoma Coast. From 115, 777, Swan, and Pommard clones. Medium-dark ruby color, displaying a darker fruit profile along with earth, pepper, and herbs. Another big and structured Pinot, this will also need plenty of time in the cellar. Comments: The fruit for Sojourn’s wines came from both the western Sonoma Coast region and from the Petaluma Gap. SCV 2011 Sauvignon Blanc, Laguna Vista Vineyard, Sonoma Coast. From mostly Musqué clone, 60% barrel-fermented, 40% in stainless steel, aged sur lie. Medium straw color, this had citrus, tropical fruit, and vanilla scents along with an herbal note. Medium-rich mouthfeel with a smooth finish. SCV 2009 Chardonnay, Antonio Mountain Vineyard, Aria Block, Sonoma Coast. Light yellow color, showing pear and nectarine fruit, lots of spice, and undertones of vanilla. Fairly rich on the palate with moderate acidity, this had a smooth finish. SCV 2009 Pinot Noir, Bodega Ridge Block, Sonoma Coast. Sourced from two vineyards. Medium color, with black cherry and plum, spice, and vanilla/oak aromas. Medium-bodied, this had good structure and a lively finish with moderate tannins. Comments: The wines are made by Tony Austin, who studied under André Tchelistcheff and has made wines for a number of producers in Santa Barbara and Sonoma counties over the years. Tony poured the wines along with owner John Drady. Trombetta 2010 Pinot Noir, Gap’s Crown Vineyard, Sonoma Coast. From a vineyard in the Petaluma Gap, with Swan, 777, and 828 clones, aged in about 50% new oak. Medium-dark color, with dark fruits, earth, mushroom, some vanilla/oak, and a touch of “Pinot funk” on the nose. Big and rich but with plenty of balancing acidity, this finished with moderate tannins. Comments: The 2010 Pinot marked Trombetta’s initial release. Other vineyard-designate releases are planned in the future. Zepaltas 2011 Pinot Noir, DeVoto Vineyard, Sonoma Coast (barrel sample). The vineyard is located west of Sebastopol, with Goldridge soil. Entirely from 828 clone Pinot and about 50% whole-cluster fermentation. Medium color, still showing somewhat primary with bright red fruits, herbs, and baking spices. Medium-light weight on the palate, with tannins that will need time to soften. Zepaltas 2010 Pinot Noir, Sonoma Coast. Sourced from Suacci and La Cruz vineyards. Medium-light color, displaying bright and spicy red fruits along with an herbal/stemmy note. Medium-bodied with a moderate tannic grip on the finish. Zepaltas 2009 Pinot Noir, Sonoma Coast. Medium color, this had more intense aromas of red cherry, rhubarb, herbs, and earth. A bit bigger on the palate than the 2010 bottling, this had good acidity and a long finish with medium tannins, nice. Zepaltas 2007 Pinot Noir, Suacci Vineyard, Sonoma Coast. Medium-dark color, with a somewhat higher-toned ripe dark berry fruit along with herbs and a touch of minerals. Medium weight with zippier acidity and grippier tannins on the finish. Comments: Ryan Zepaltas (who’s also the assistant winemaker at Siduri) typically uses about 30-40% whole-cluster fermentation on his Pinots.